These truffles are inspired by my friend Heather, who suggested hazelnut paste would be good in truffles and told me her Mum always rolled her truffles in chopped hazelnuts. Here’s what we came up with at Dunford Grove. This is a very handy recipe for using up leftover chocolate ganache. I always make plenty of ganache because I’m frightened I won’t have enough to fill, cover and decorate my cakes. Leftover ganache keeps well in the fridge for a month or so and freezes well too. So, save all your little bits of ganache and make these delicious mouthfuls. Grind the hazelnuts in a food processor until finely ground. Drizzle in enough olive oil to make a paste with a consistency similar to peanut butter. Set aside. Place the cream in a small saucepan and bring up to a simmer. While the cream is heating, break the chocolate into small pieces. When small bubbles form round the edge of saucepan, drop in the chocolate and draw the pan off the heat immediately. Leave the mixture for a couple of minutes then, using a whisk, stir gently to create a smooth dark cream. Set aside to cool and thicken slightly. Soften 130g ganache to a stirring consistency and blend in a 200g of hazelnut paste. Mix well and spoon or pipe bite-sized portions on to a foil lined tray. Refrigerate until firm. 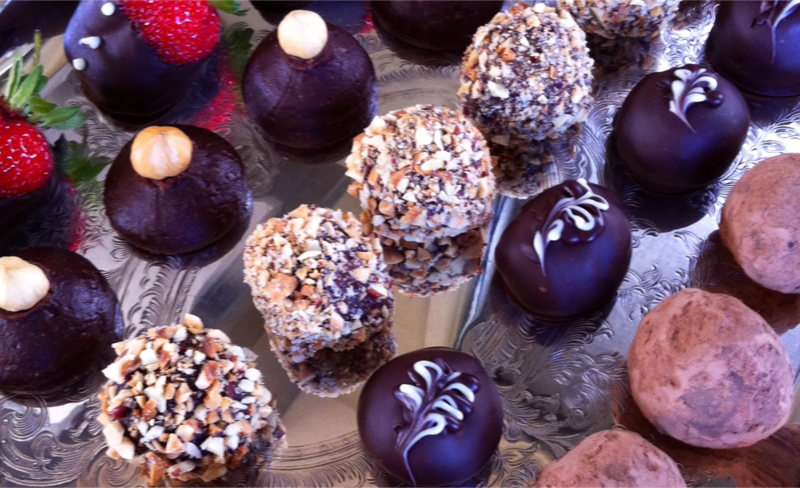 Decide how you want to finish your truffles. The simplest way is to sit a roasted hazelnut on top while the mixture is still soft. Also easy is to roll the chilled portions into balls, then roll in chopped hazelnuts, or sifted cocoa, or coconut. A little more time consuming is to dip each chilled ball in melted chocolate. They’re all delicious. © 2018 Dunford Grove - website by KiwiSites.